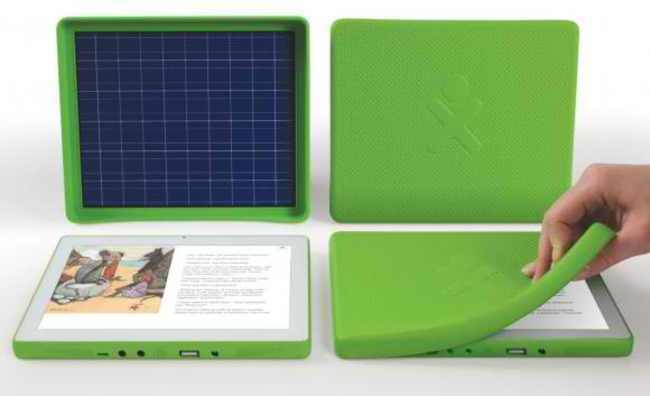 One Laptop per Child’s (OLPC) XO-3 has been unveiled, and it is wrapped in silicone. The 8-inch XO-3 has a Marvell ARMADA PXA618 pocessor and 500mb of RAM. The silicone in front can be easilly peeled off to reveal the screen that has a 1024×768 Pixel Qi. It guarantees visibility both indoor and outdoor. Removing the cover also reveals a USB and memory card slot and audio out, enough to cover the basics for an entry-level platform. The OS is said to be either Android or the education-focused Sugar platform. As expected, OLPC’s latest offering is easy on the pocket, with the XO-3 expected to be priced at $100. OLPC, however, will only offer XO-3 to educational organisations and charities.